Nov. 16, 2018 — When Brian Sherrington reflects on his time at the UF College of Medicine, one memory stands out. “This was the place that allowed me to become a doctor, but it’s also where I met my wife,” said the 1973 graduate and pediatrician from North Carolina, as his wife smiled next to him on the terrace of the George T. Harrell, M.D., Medical Education Building Saturday. Four decades ago, Sherrington was at an end-of-rotation party with his roommate, who was married to a teacher. 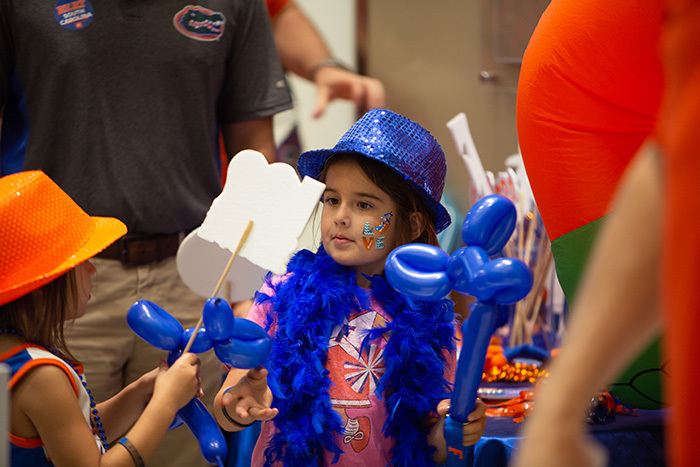 She brought along a fellow teacher named Jeanette — a UF College of Education graduate — and Sherrington’s future was sealed. 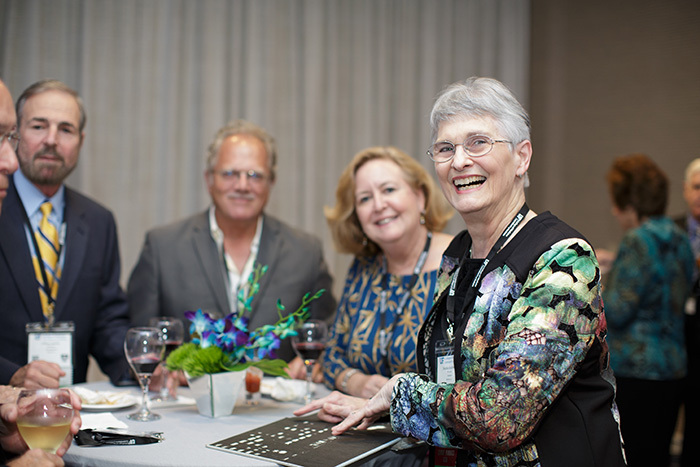 The two were married right before his medical school graduation in 1973, and over the years the couple returned to campus for Alumni Weekend with their three young children to reconnect with classmates and see the growth of their alma mater. 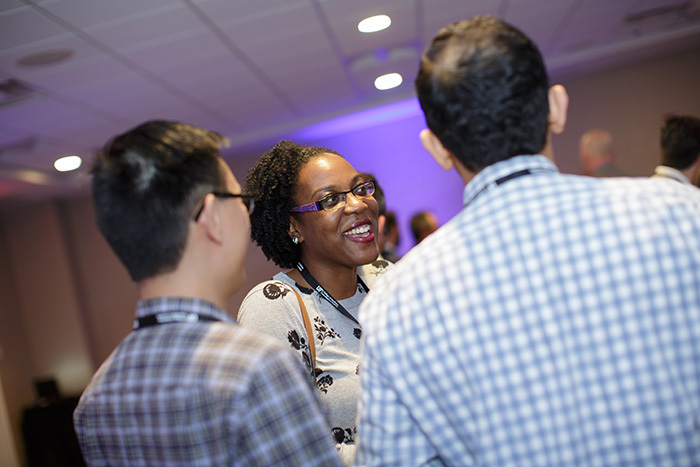 This sentiment of renewing connections and seeing innovative changes around campus was a common theme among the 450 graduates and friends who attended Alumni Weekend 2018 from Nov. 9-10. The weekend kicked off Friday with an interactive deans’ panel about educating future health care leaders with speakers including Joseph A. Tyndall, M.D., M.P.H., interim dean; Joseph Fantone, M.D., senior associate dean for educational affairs; and Nina Multak, Ph.D., MPAS, associate dean and the Randolph B. Mahoney Director of the School of Physician Assistant Studies. Marian Limacher, M.D., senior associate dean for faculty affairs and professional development, Stephen Sugrue, Ph.D., senior associate dean for research affairs, and Timothy Flynn, M.D., former senior associate dean for clinical affairs, also served on the panel. The speakers emphasized the essential role of the doctor-patient relationship and the challenges physicians face. 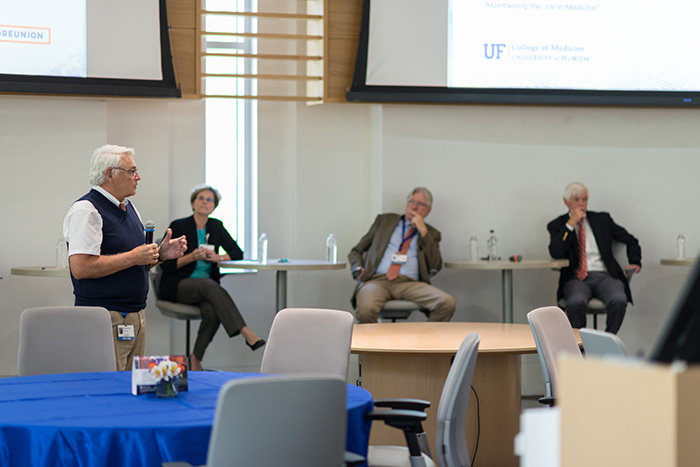 At the UF College of Medicine, panelists said, students are taught not just the importance of relationships but also the holistic approach to caring for one’s community through service and research. Multak noted that students in the health professions are not taught in silos but in a team-based environment that allows future physicians to understand how to work alongside colleagues such as PAs, pharmacists and nurses. 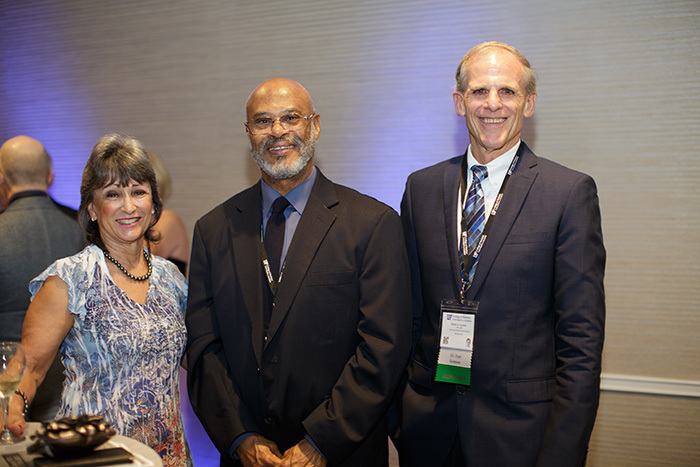 The festivities continued with a notable alumnus lecture from Renee Blanding, M.D. ’88, vice president of medical affairs and medical director of the operating room at Johns Hopkins Bayview Medical Center and an assistant professor of anesthesiology and critical care medicine at Johns Hopkins School of Medicine. 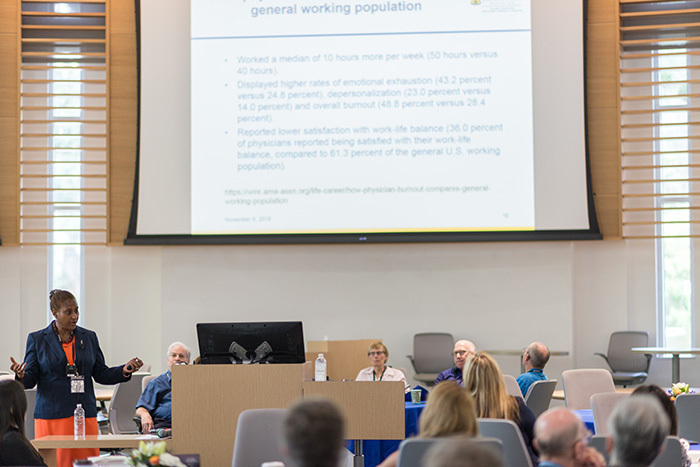 Her talk, titled “Maintaining the Joy in Medicine,” focused on the increasing rate of physician burnout and how doctors and organizations can combat its effects. “We need to come up with creative solutions for preserving well-being,” she said, noting that a task force has been created at her institution to address this issue through efforts such as hiring a chief wellness officer and forming an online community, where providers can share stories to reflect on their commitment to clinical excellence and combat feelings of isolation. Brian Hoh, M.D., chair of the Lillian S. Wells department of neurosurgery, and Thomas Beaver M.D., a professor and chief in the division of thoracic and cardiovascular surgery, took the lectern next to share innovations in their specialties made possible through breakthroughs in medicine, the collaborative nature of UF and the opening of the new UF Health Heart & Vascular and Neuromedicine hospitals. “Looking at the campus, it’s unbelievable how much it’s advanced — but even 20 years ago, they were so innovative here,” said Farzin Foruhari, M.D. ’98, an internal medicine physician from Kentucky who sat in the North Learning Studio of the Harrell Medical Education Building — which didn’t exist in the 1990s — next to classmate Hanh-Dieu Nguyen, M.D. ’98, a family medicine physician from Texas. Friday events wrapped up with a ceremony recognizing UF College of Medicine Wall of Fame honorees Jason Rosenberg, M.D. ’95, and William Friedman, M.D., H.S. ’82, and a dinner at Hilton UF to celebrate milestone reunion years. 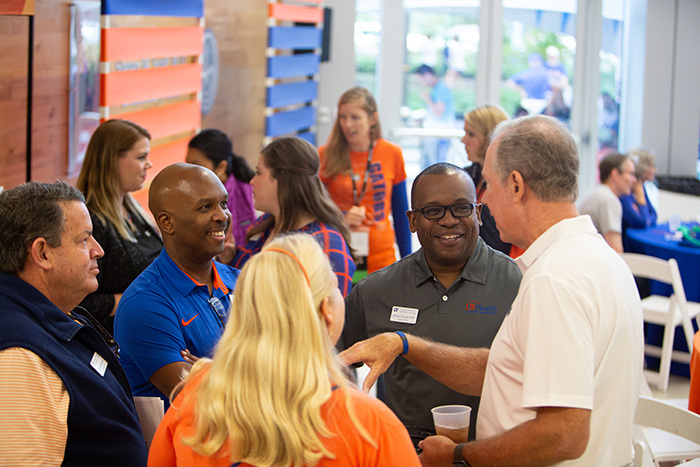 On Saturday, graduates sported orange and blue attire as they participated in tailgate activities, took tours of the Harrell Medical Education Building and met with the next generation of health care professionals at a student-alumni speed networking session. 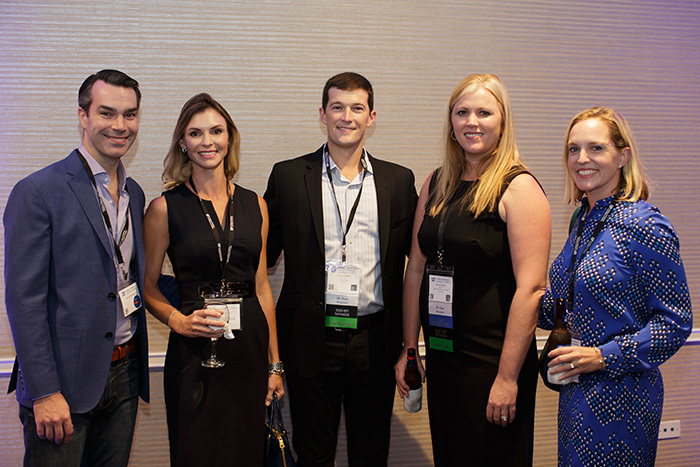 M.D.-Ph.D. student Leanne Dumeny said she tries to attend the networking event each year to gain insight from Gator graduates. “I want to show support to our alumni who come back for reunion and also express gratitude to those who support us students,” she said.